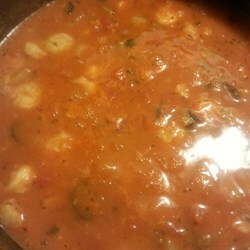 This is a very hearty soup from the Mediterranean. If you prefer a heartier soup, add more fish. 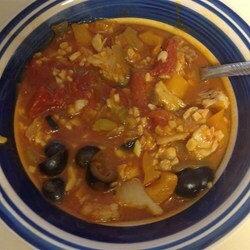 Place onion, green bell pepper, garlic, tomatoes, chicken broth, tomato sauce, mushrooms, olives, orange juice, wine, bay leaves, dried basil, fennel seeds, and pepper into a slow cooker. Cover, and cook on low 4 to 4 1/2 hours or until vegetables are crisp tender. Stir in shrimp and cod. Cover. Cook 15 to 30 minutes, or until shrimp are opaque. Remove and discard bay leaves. Serve.